Those familiar with IRI CoSort know they must define the structure of their sources and targets in SortCL data definition file (DDF) syntax. /FIELD definition has traditionally been a manual discovery and specification process, or the result of a command line conversion program like cob2ddf (for COBOL copybooks). Today, IRI Workbench creates source metadata in reusable DDFs automatically. The "Metadata Discovery" wizard parses database tables and delimited files automatically to generate the DDF. Users with fixed or unspecified sequential data can visually define their source layouts. Sliders parse the fields visually, and the wizard creates the metadata automatically. The screenshot below shows how to define fixed-position fields by moving to the start and end of each field in a source data preview window. Once you add a field, the bottom spreadsheet view reflects the DDF specifications (which you can then modify). For records with delimited fields, a column-based editor is provided instead, as sliders are unnecessary. 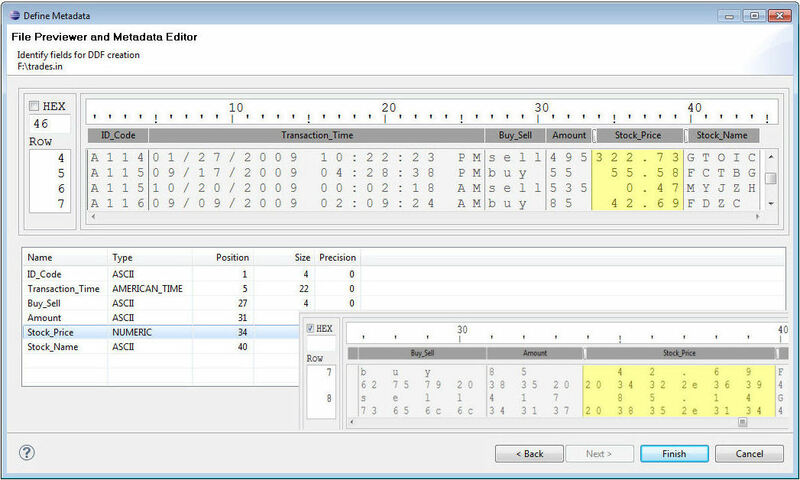 A HEX view option facilitates the definition of binary data. Migrating existing data descriptions to DDF repositories is now automatic, too. 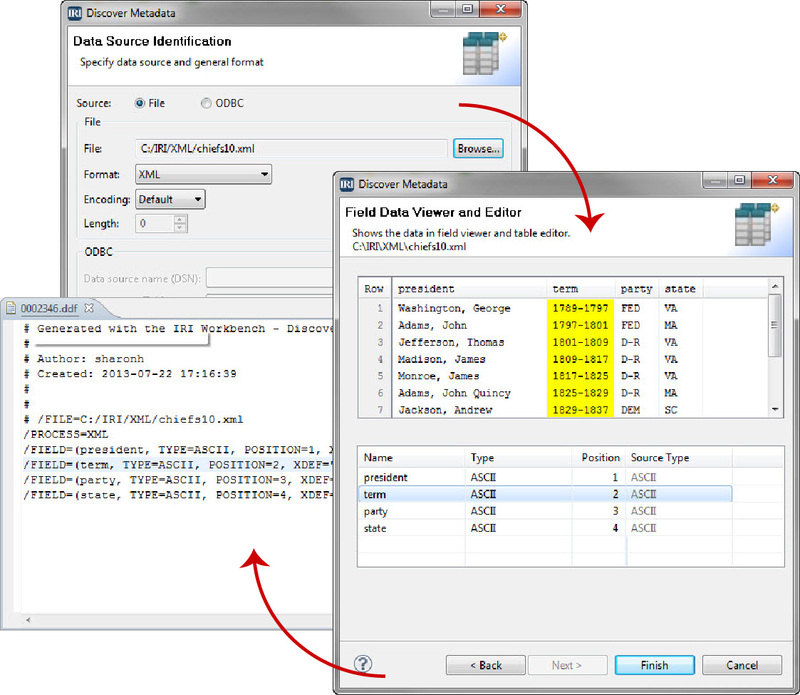 The Metadata Conversion wizard in IRI Workbench parses CSV, CLF, LDIF, and XML and other delimited files and creates DDF files with the corresponding /FIELD statements. The same wizard can also convert third-party metadata repositories like COBOL copybooks and SQL Loader Control Files into SortCL DDF. There is also a wizard to convert and import third-party sort specifications (e.g., JCL sort parm for z/OS MVS or VSE) into SortCL job scripts, as well as an SDK documenting how to feed or read SortCL DDF and command metadata from Java applications.